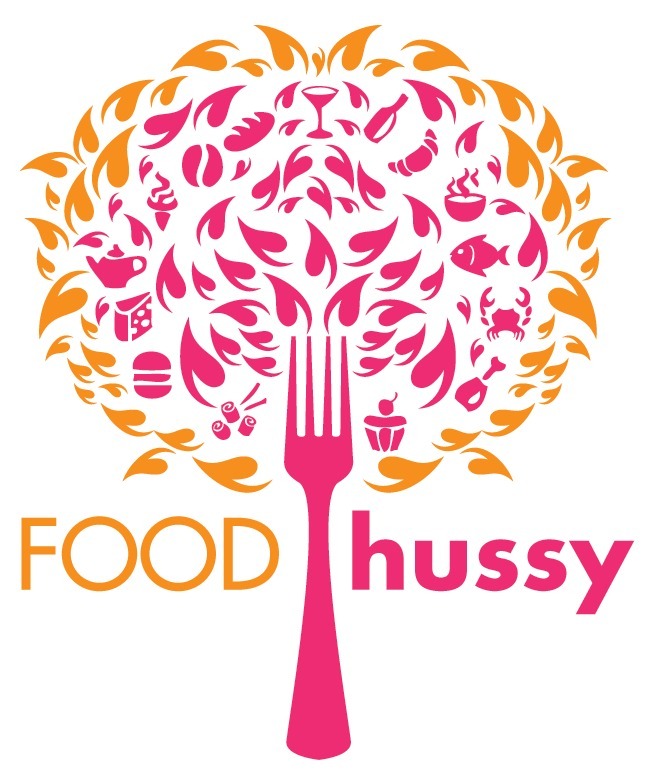 Food Hussy Recipe: Spicy Frisch's Big Boy Pizza | The Food Hussy! This post is sponsored by Frisch's Big Boy. All opinions are my own. I have been a fan of Frisch's ever since I moved to Cincinnati! 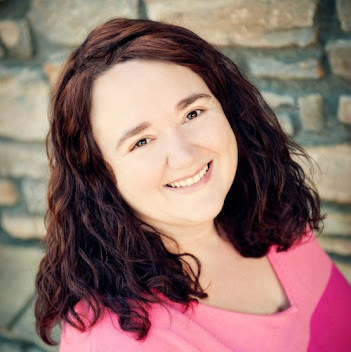 There are Big Boy restaurants around the country - but here in Cinci - they're known as Frisch's and we love them! The signature sandwich is the Big Boy of course! It's a similar to the Big Mac but the special sauce is tartar sauce - and it's just fresher, bigger and way more delicious! 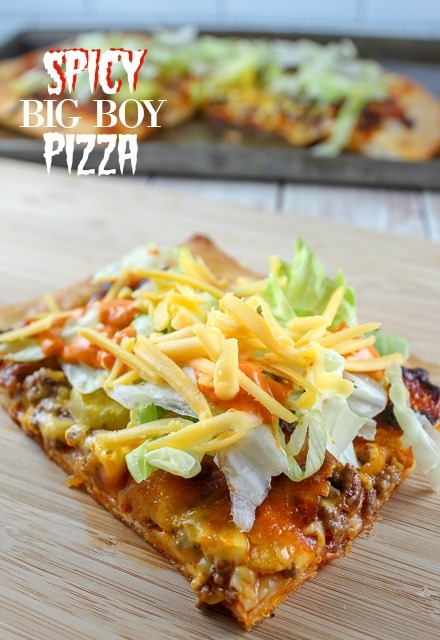 But in Cincinnati - we like to mix things up a bit - so we've been known to take the Big Boy sandwich and make it into a pizza! 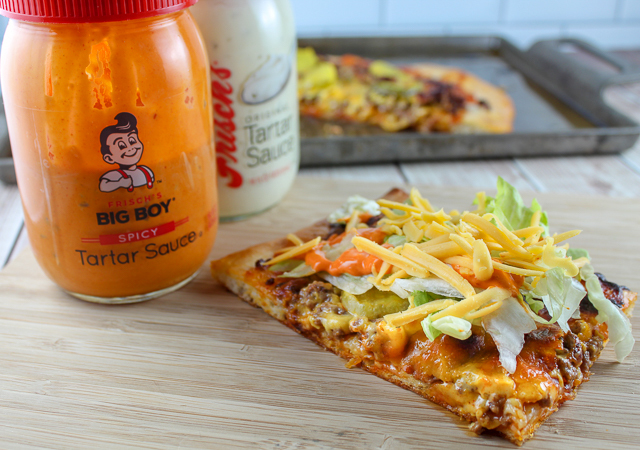 The Spicy Big Boy Pizza has all the elements of the Big Boy Sandwich! Most importantly - TARTAR SAUCE - then seasoned ground beef, pickles, American Cheese and lettuce. Now you might be saying to yourself - "Tartar Sauce on a pizza???" - let me tell you - IT IS DELICIOUS!!!! Like I was SHOCKED at how much I loved it!!! Also - since I am using the Spicy Tartar Sauce - I decided to add some of my famous Copycat Taco John's Seasoning Mix to the meat - to make it a little spicier! You can go as heavy as you want with it depending on how spicy you like things! Or - if you want to skip the spicy - go with the traditional Frisch's Tartar Sauce (you can buy it online too - if you're not in Cinci). After you take it out of the oven - top with a little more cheese and lettuce and serve with a side of Frisch's Tartar Sauce - Spicy & Regular! 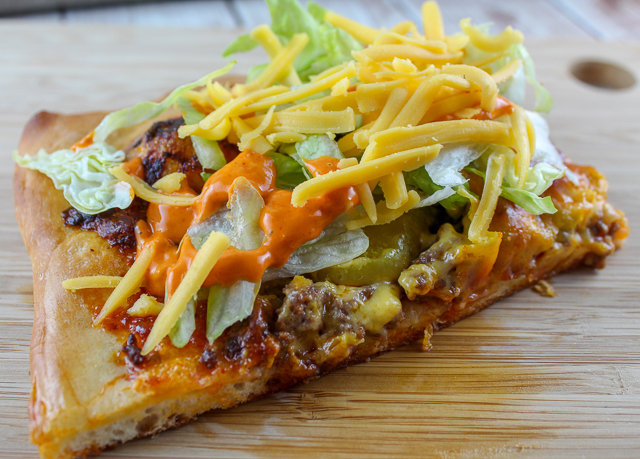 This pizza will quickly become a family favorite and it makes pizza night so fun! Frisch's is an institution here in Cincinnati and the signature sandwich is a Big Boy - which is 2 beef patties, cheese, lettuce and tartar sauce. Well I made it into a pizza!!! And I used their brand new Spicy Tartar Sauce to kick it up a notch! This looks delicious!!! I would have never thought to put tarter sauce on pizza!